The crowd gathers round as a servant of the king measures the sizes the feet of young debutantes, looking for the one who lost a shoe at the grand ball at the stroke of midnight. This will be the true love of the prince. And this is, of course, Cinderella, who in this painting is off the the side, holding the other golden shoe in her hand. 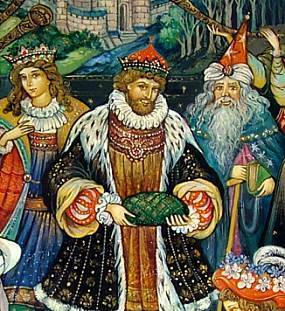 The prince and king are nearby, the latter holding a cushion that the shoe was carried in on. 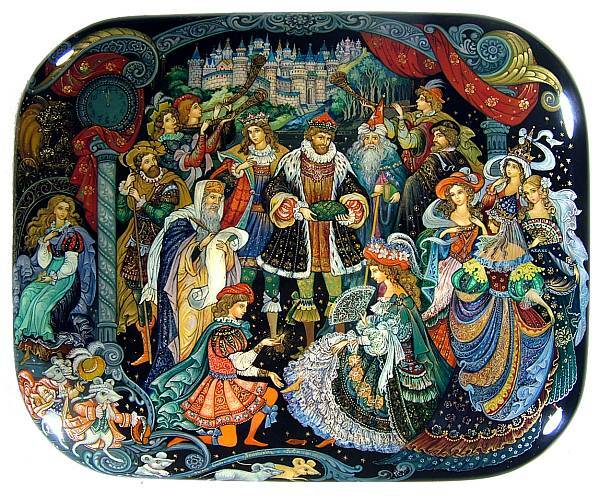 The scene is a marvelous depiction of Perrault's fairy tale with a great variety of characters in very elaborate costumes, each one gleaming in gold accents and vivid colors. With all the splendor, details like the clock at 12 or the pumpkin carriage at the top left are easy to miss, but enjoyable to find. The kingdom in the background is done superbly,as well, with a nice three dimensional look to it. 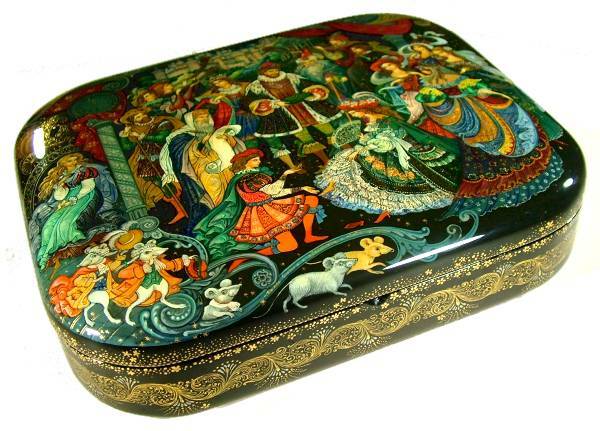 There is an elaborate gold ornament which adorns the sides of the box. The base color on the outside is black, the interior is traditional red. The box is made out of high quality papier mache and has a hinge at the top. It stands on four small carved legs. Signed at the bottom with the name of the box, village, year and title. Very lovely.